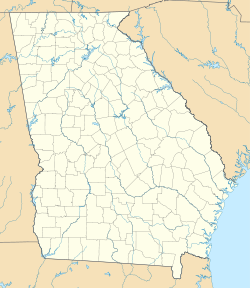 Athens, formally Athens-Clarke Coonty, is a unified ceety-coonty in Georgie, U.S., in the northeastren pairt o the state. The Varsity o Georgie is locatit in this college toun an is responsible for the initial growthe o the ceety. In 1991, efter a vote the precedin year, the oreeginal ceety abandoned its chairter in order tae form a unified govrenment wi Clarke County, referred tae collectively as Athens-Clarke Coonty. 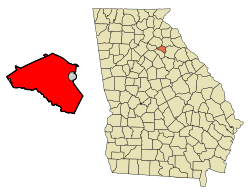 As o the 2000 census, the consolidatit ceety-coonty (includin aw o Athens-Clarke Coonty except Winterville an a pairt o Bogart) haed a total population o 100,266. The maist recent US Census estimate (2009) placed the population at 114,983. Athens-Clarke Coonty is the fift-lairgest ceety in Georgie an the principal ceety o the Athens-Clarke Coonty, Georgie Metropolitan Statistical Aurie, which haed a population o 189,264 as o the 2008 Census Bureau estimate. Athens haes three sister ceeties. ↑ "Annual Estimates of the Population of Metropolitan and Micropolitan Statistical Areas: April 1, 2000 to July 1, 2007 (CBSA-EST2007-01)" (CSV). 2007 Population Estimates. United States Census Bureau, Population Division. 2008-03-27. Retrieved 2009-01-28. ↑ Museum Stuff. Retrieved July 23, 2010. Wikimedia Commons haes media relatit tae Athens, Georgia.